K10 is a National Apprenticeship Service (NAS) accredited, Apprenticeship Training Agency (ATA), independent of any contractor or developer. An award winning Social Business founded in 2010 to address the difficulties contractors faced when trying to deliver effective apprenticeship programs and reverse the declining numbers of apprentices working within the construction industry. K10 recognises the short term nature of most sub-contract packages and operates a model that allows for this limited duration of opportunity whilst taking full responsibility for the individuals’ apprenticeship and all associated employer obligations. K10 sources, prepares and employs local residents that are looking to progress into the construction industry, whilst ensuring that high standards of vetting and due diligence are in place throughout. The scheme recruits candidates on a borough by borough basis and matches these individuals with apprenticeship opportunities generated by the construction projects within their local area, creating sustainable, life-changing opportunities. The scheme provides mentors who support the apprentice and contractor for the duration of the apprenticeship, providing the interface between the host employer, the training provider and the trainee to ensure smooth delivery of the programme. K10 undertakes weekly apprentice contact and monthly site visits to assess an individual’s development, monitor performance and provide progress reports whilst resolving any issues that may arise. Finding local job ready candidates. Providing continuous employment for the duration of an apprenticeship. Main contractor’s not directly employing trade disciplines. Short term nature of subcontractor works. Contractors having a lack of resource within HR, outreach, pre-employment, pastoral care and college management. The contractor hosts the apprentice for the duration of their involvement on the construction project and is charged an hourly fee; this fee covers the trainee’s wages, holiday and sick pay, employer’s NI contributions and accredited training course costs. There are no further costs to be met by the contractor. If or when the contractor has no more work for the apprentice, K10 arranges for the apprentice to move to another project, within their home borough, to continue their apprenticeship. Runs employability workshops to source and assess suitable candidates from the local borough. Provides CSCS and L1 H+S training and certification. Provides a £200 tool allowance and PPE. College enrolment and management therein. Administers the apprentice’s payroll and PAYE contributions. Manages holiday pay, sick pay and maternity/paternity leave entitlements. Provides ongoing mentoring and support to the apprentice. Contractors are charged an hourly rate of £8.95 + VAT for first year apprentices and £12.00 + VAT for second year apprentices. 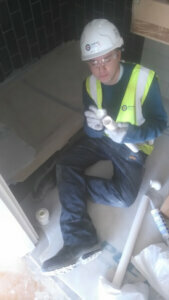 The hourly charge rate is applicable to the hours that the apprentice spends on site and at college. Background: Ivan, one of our first shared apprentices with Heathrow Academy, was studying Electrical Engineering and Construction Multi Skills at college before joining K10. Ivan, one of our first shared apprentices with Heathrow Academy, was studying Electrical Engineering and Construction Multi Skills at college before joining K10 Apprenticeships. Upon completion of his studies, Ivan jumped straight into job hunting. Ivan had an urge to be productive with his life and didn’t want to waste any time. University never seemed to be an option for him. Ivan eventually got a job working in a Warehouse, but it was not something that he enjoyed. From the very beginning, he wanted to be on site and working towards leading a project. Whilst he was in college, he struggled with the process of applying for jobs. He eventually came into contact with K10, who he has been very impressed with so far. 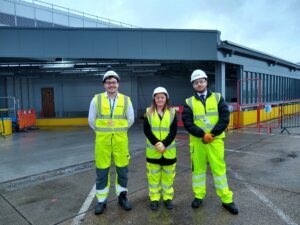 He initially came in for an alternative role, but during his interview he displayed skills that the K10 team believed would fit the Project Management role that we had received from Balfour Beatty on their project T1 Baggage Project at Heathrow Airport. Ivan will be starting his Level 4 Project Management course in January, which he will be studying with Moreskills at the Heathrow Employment and Skills Academy. K10 Training now provides an easy way for contractors to meet their work, experience and traineeship obligations. 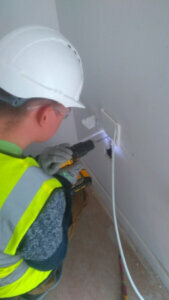 K10 sources and vets candidates, from all over London, provides them with CSCS cards and PPE and co-ordinates their placement on your project, it could not be easier. Candidates aged 18 plus from any of the London Boroughs. City and Guilds Award in Employability Skills. City and Guilds Award in Construction Skills. K10 co-ordinates the 3 week work experience placements around your programme.